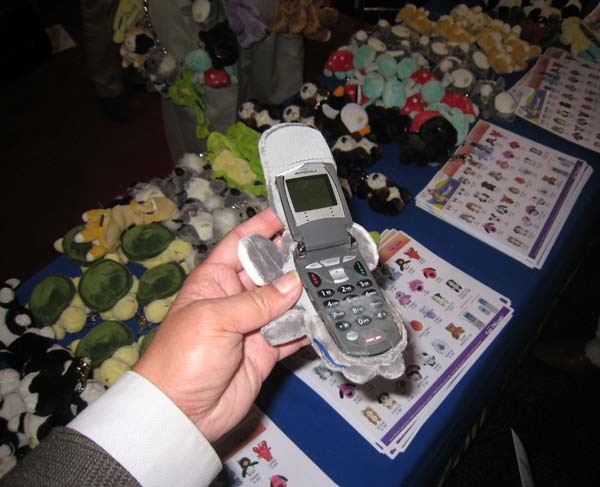 CTIA, which likes to describe themselves as the wireless association, might now be better described as something like the connected handheld computer association. Most old-style phone issues take a back seat to things like connectivity (4G) and content (applications, entertainment, advertising). As you will see below, while there is still plenty to talk about in standard phones, we highlight the products that represent the new morphed industry. The Skype iPhone app went on the App Store today (Mar 31, 2009), and is already the #1 popular (free) app. Most useful if you are dialing internationally because you can make a phone call over WiFi (but not 3G). You can also text to people without paying the carrier. 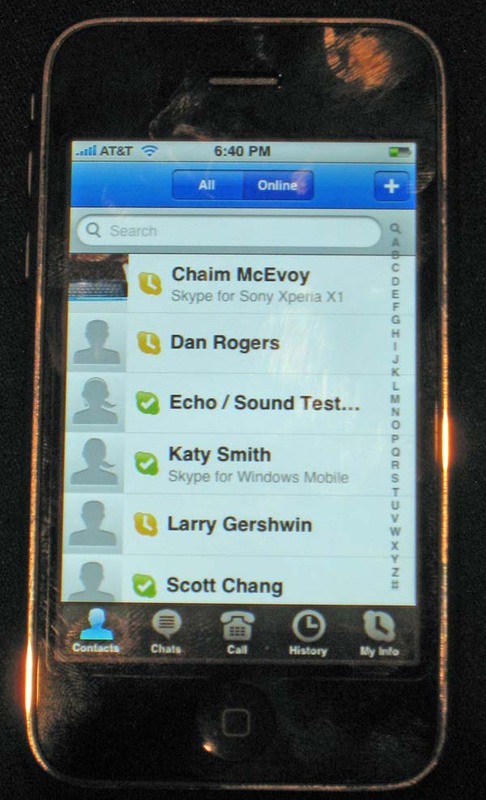 This is an Asus AiGuru SV1 video phone that was introduced about half a year ago. Cute and maybe even useful for heavy video Skype users. 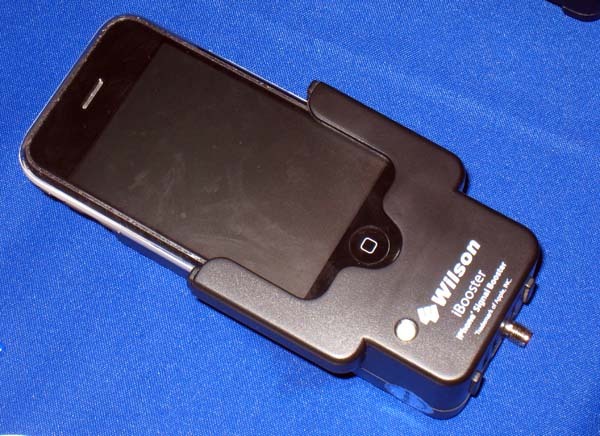 Truphone is an alternative to the Skype iPhone app, but it also works with Skype and allows voice calls over the carrier (not just WiFi) Wilson makes this signal booster for your iPhone in your car. 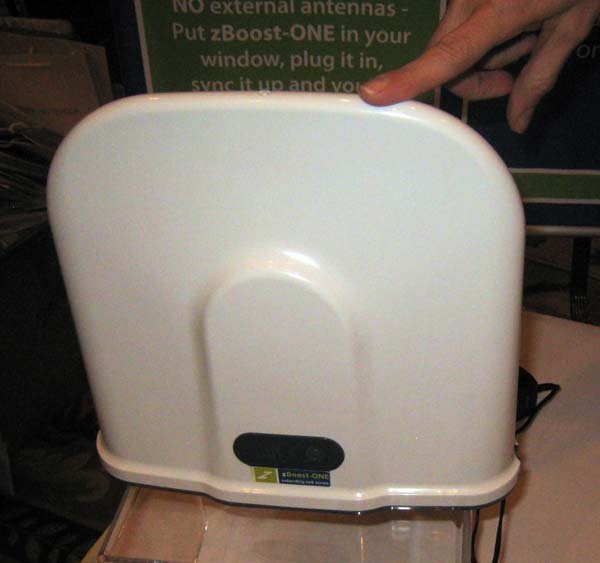 An external antenna is connected via the cradle. Takes a little installation work. Sort of "old school" meets the iPhone. About $279. 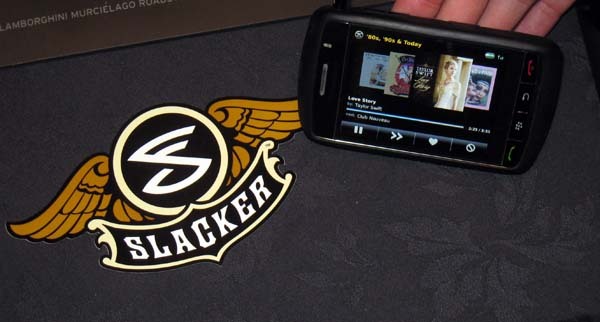 Slacker radio has this free app that gives you all kinds of radio theme stations (you listen to commercials unless you buy the premium service. You can indicate your preferences in music and they help you select what to listen to. They claim it is better than Pandora. 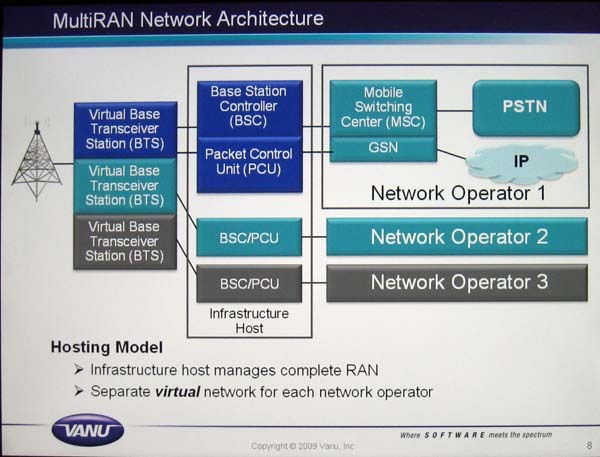 Vanu offers a software solution that lets multiple carriers share the same tower. This means fringe areas might be better covered because carriers can share costs and tower placement. 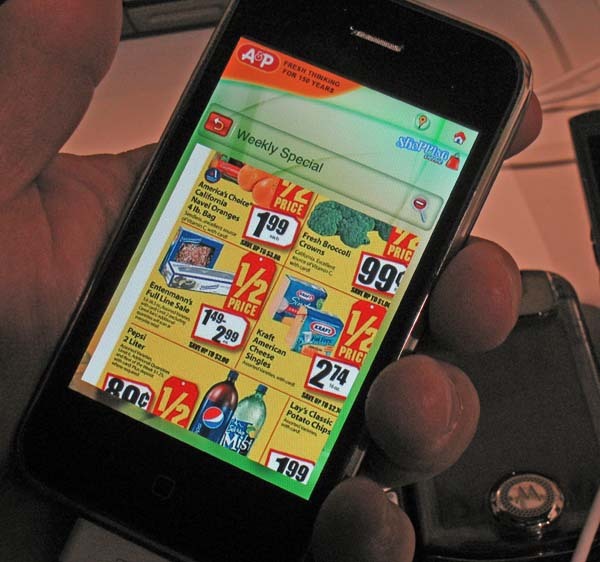 Abbyy sells OCR software to app developers. 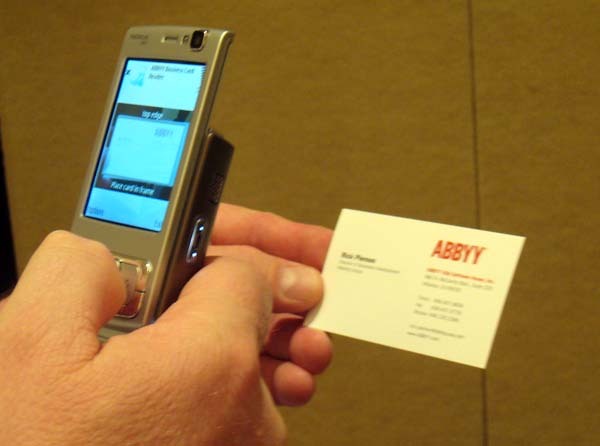 Take a photo of a business card and the data goes into your contact list. Other applications, such as translators, exist. 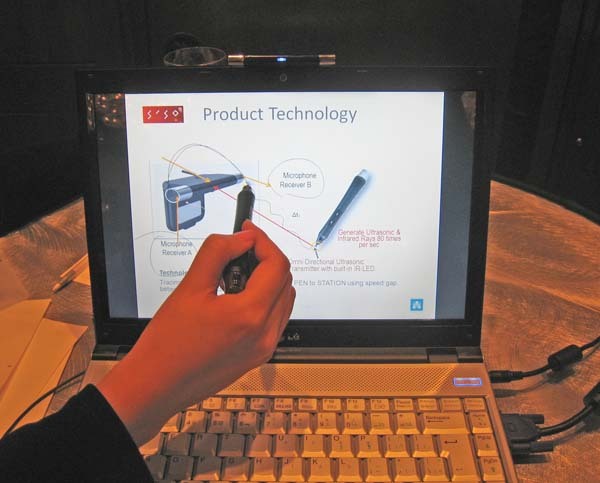 Reading a business card might require a phone with a fairly good camera (2M pixel or better with good auto focus) Hantech from Canada makes Tablo, a device that converts your laptop display into a digitizing tablet by reading the special pen via a sensor on the top of the display. This not a phone app, but clever nonetheless. Not sure how people will feel about drawing on their notebook screen, but it is only about $99 US. The Vitality GlowCap lets your pharmacy monitor if you have taken your pills. If you forget, the cap glows, then chirps, and eventually you get a phone call. The cap can communicate to a base station. A version can use cellular phone communications. 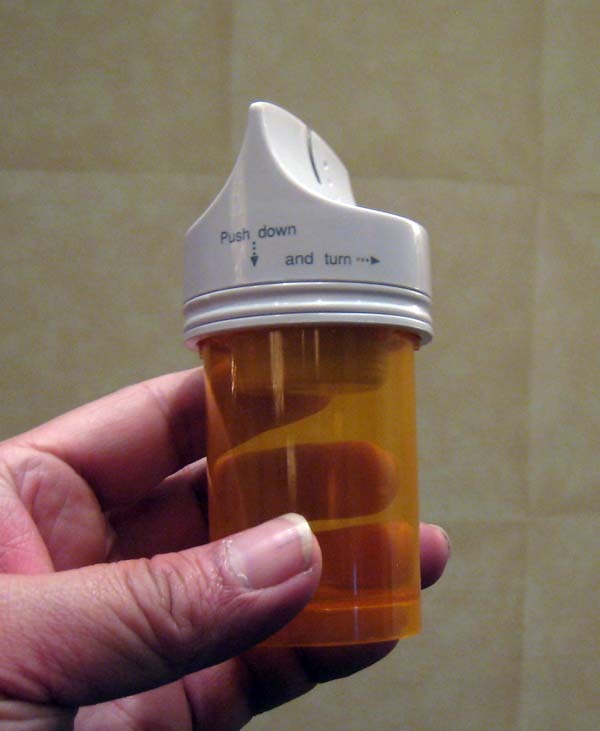 The idea is that the pharmacy builds the cost of this reusable cap into the cost of your pills. 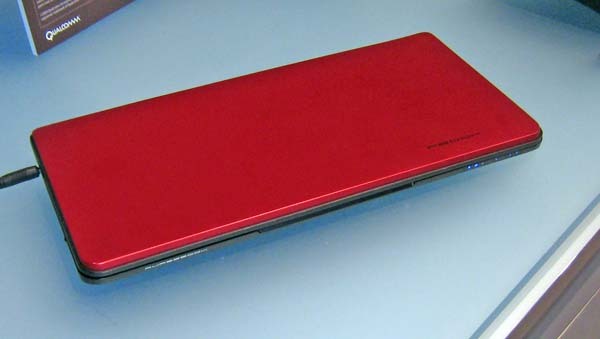 The battery lasts 6 months for the WiFi version. Not yet part of the Continua effort. 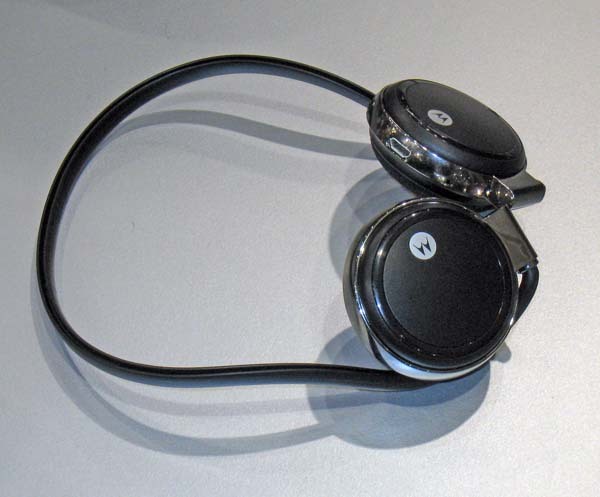 Motorola just introduced this Bluetooth stereo headset. It will be available first with Verizon, and later with others. Price range is $50 to $75. 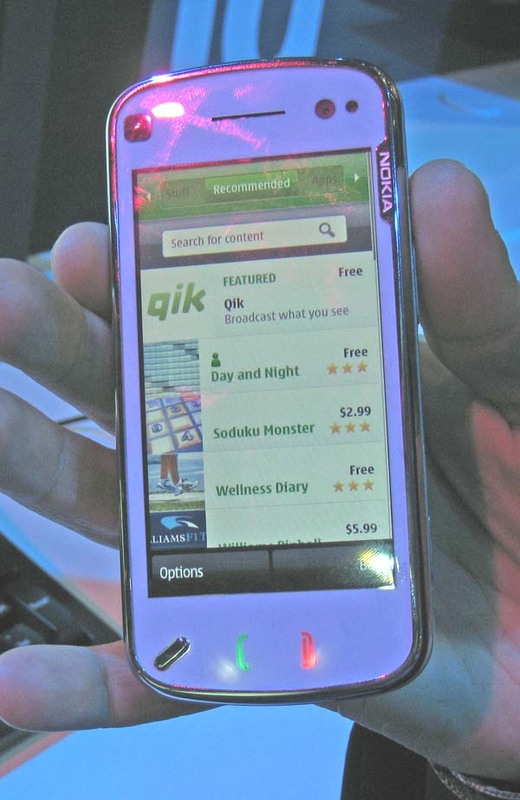 Nokia has a content sharing site called OVI. 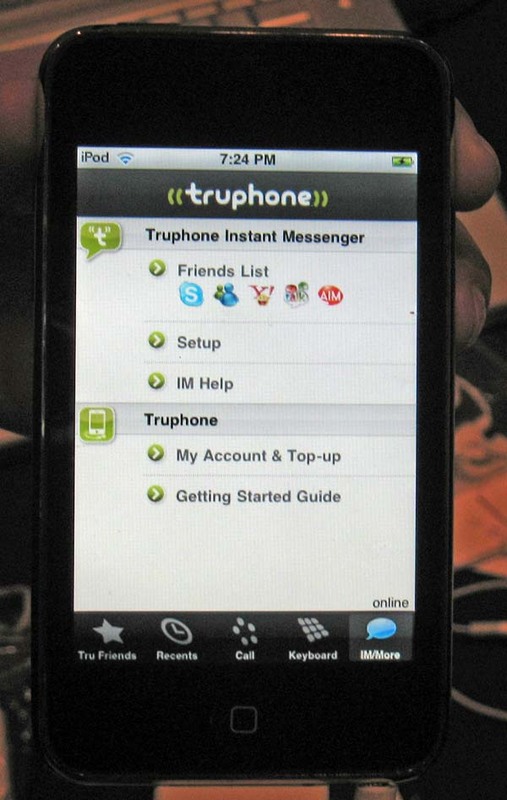 With an application built into the phone a user ca upload photos and videos for others to see. Now they are starting the OVI Store so you can buy apps for your Nokia phone. 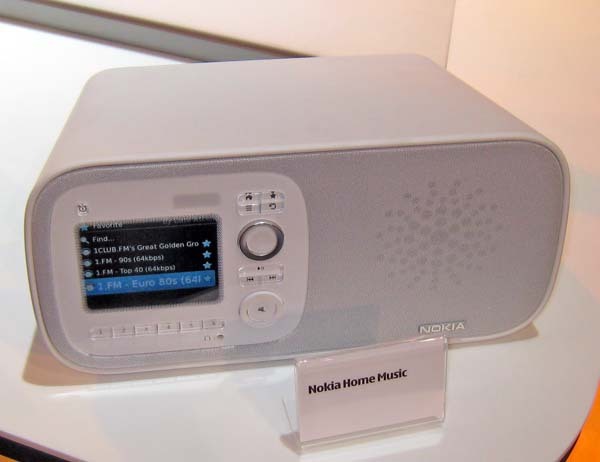 Nokia is trying out some non-phone consumer products. 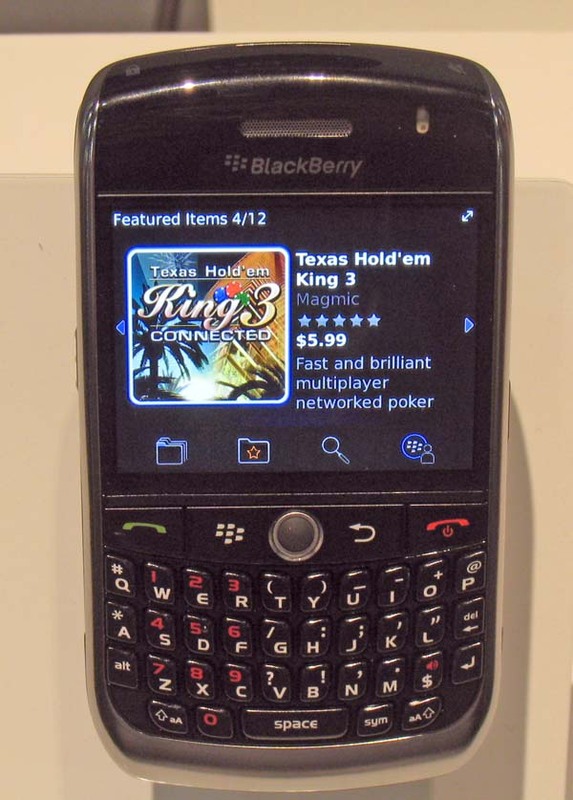 Perhaps a bit more well publicized is Blackberry's App World. It works much like Apple's App Store, but Blackberry enforces a minimum $2.99 price for non-free apps to help out the developer community. Further, they give an 80/20 split to the developer instead of Apple's 70/30 split. Every time we visit WiMAX booths there is a new name. At one point it was Xohm. Then it was Clearwire. 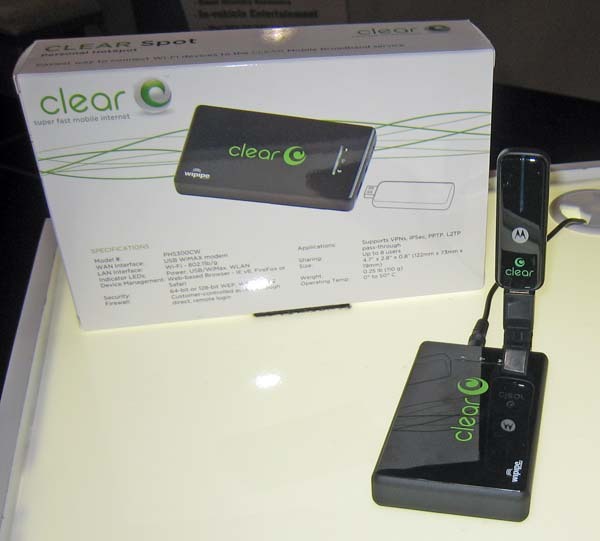 Now Clearwire has changed its name to simply Clear. 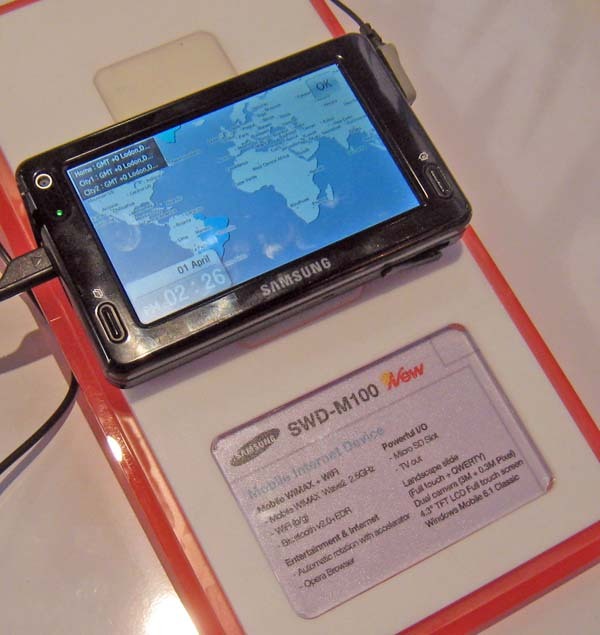 The device shown here is a WiFi router that works with a WiMAX modem to create an instant Personal Hotspot. About $139. 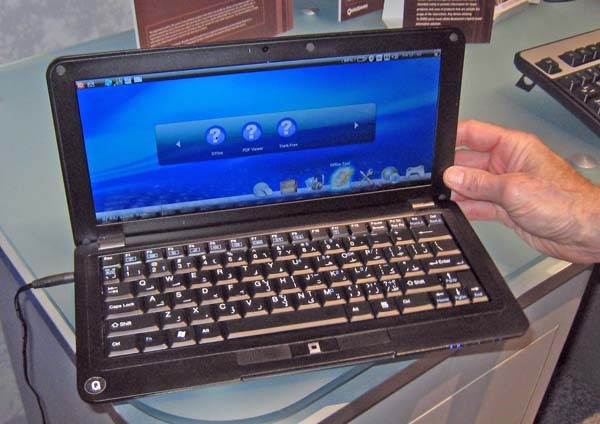 Qualcomm is about to offer a Netbook that they call Snap Dragon. Among the things to note - they plan to offer Google's Android operating sytem on it. Expect to see it in the Q4 time frame for about $400. Qualcomm is also going to offer Kayak, a browser that connects directly to the Qualcomm wireless network. You can only browse the web. No real native applications, except you can run apps on the web itself. This is aimed at 3rd world countries and they hope to sell it for under $200. 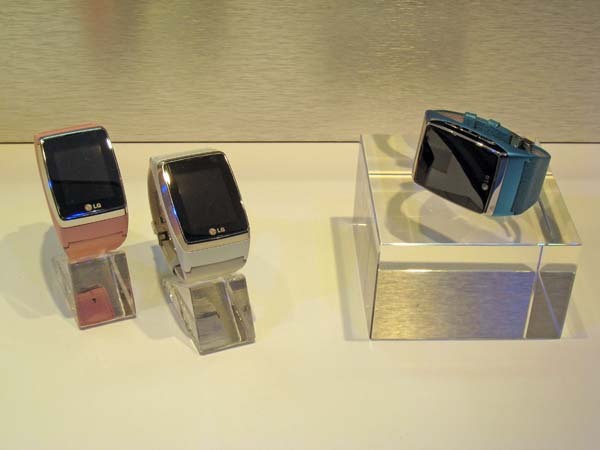 LG showed this watch phone before. Now they are showing more styling variations. These will be available in Q4 in Europe. LG is working on LTE phones (4G, alternative to WiMAX). 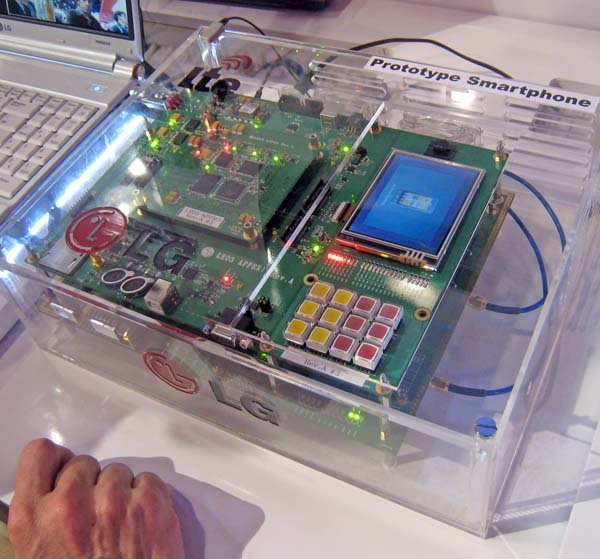 This is a photo of a working LTE phone prototype. 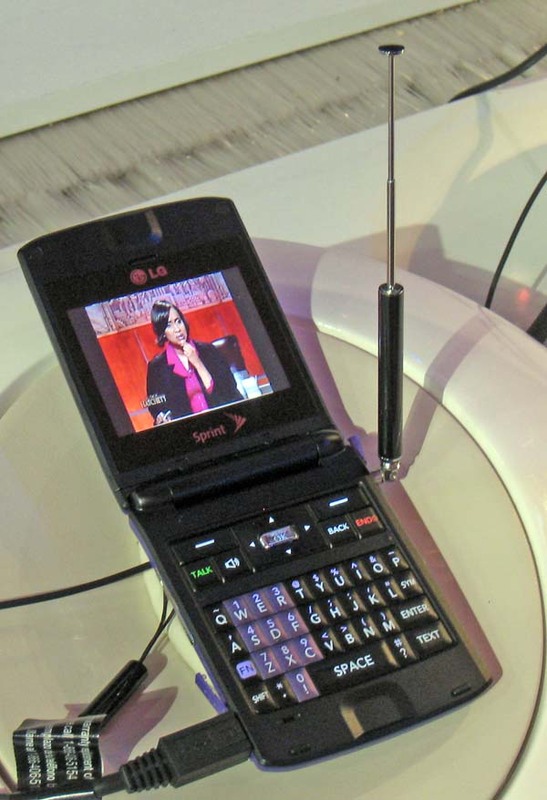 LG won the battle for mobile ATSC television. Over the months they have shown various working models. If you are not familiar with this, unlike some services, you get locally broadcast TV stations on your phone for free. 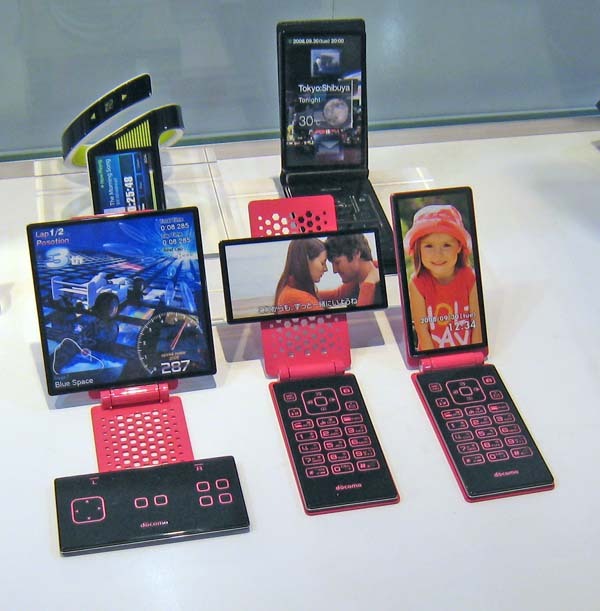 Docomo and Fujitsu showed an interesting concept - a separable phone. The unit shown on the top is a working prototype, while the ones on the bottom are not. What can you do with such a phone? You can talk with one half while looking at your calendar, etc. in the other have. 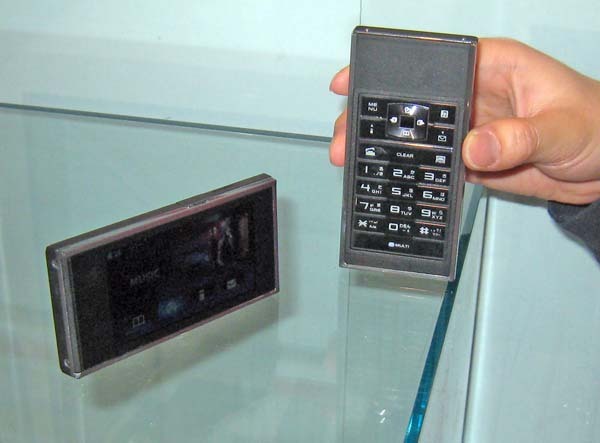 You can use one have as a remote control for the other as you watch videos. Yahoo just went live (April 1) with their portal app for the iPhone. It is a bit like their portal site for browsers on PCs, except that it also integrates some of the phone functions into the user interface. 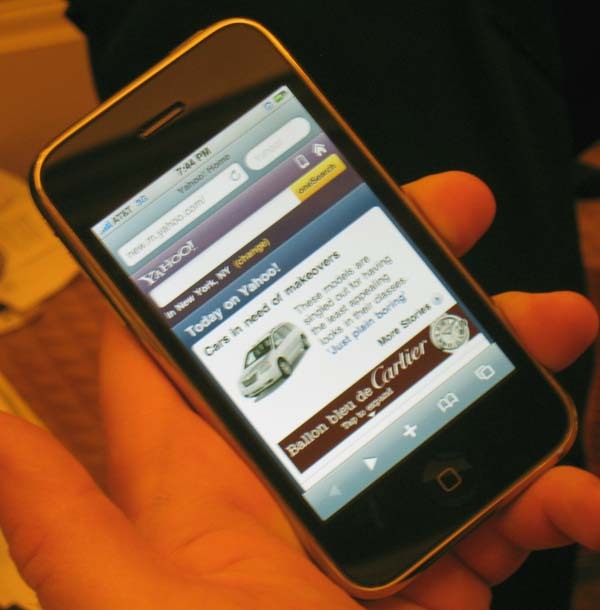 It is generally known as Yahoo Mobile. (You might not be able to get this app from the Apple Store) Now that the iPhone will soon have turn-by-turn instructions in it, Garmin, maker of portable navigation products, is working with Asus to bring out a phone. Why? They claim that it will tightly integrate everything it does with geo-tagging. Available soon. 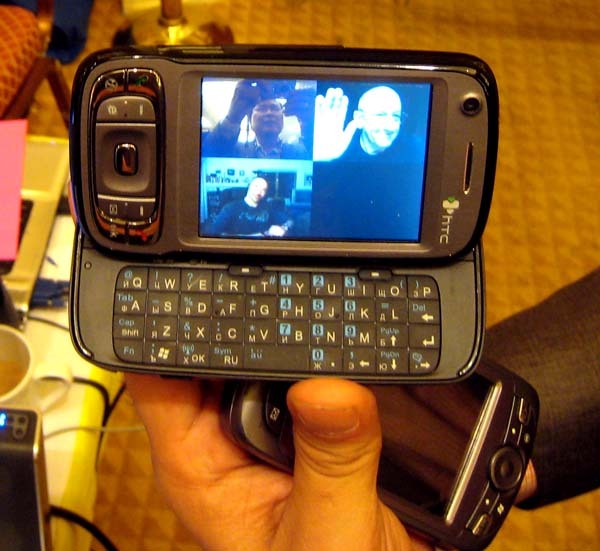 iVisit offers a mobile video conferencing service. Talk and see up to 8 people on your phone. 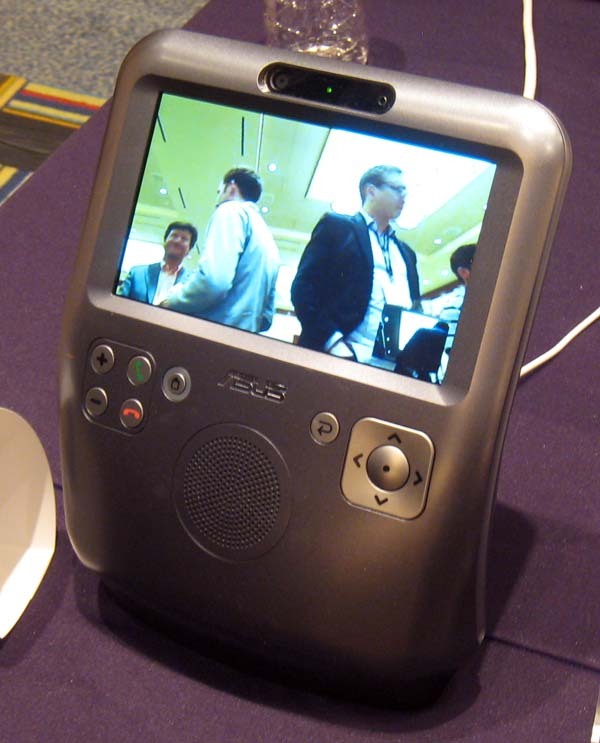 A version is set up for telemedicine. 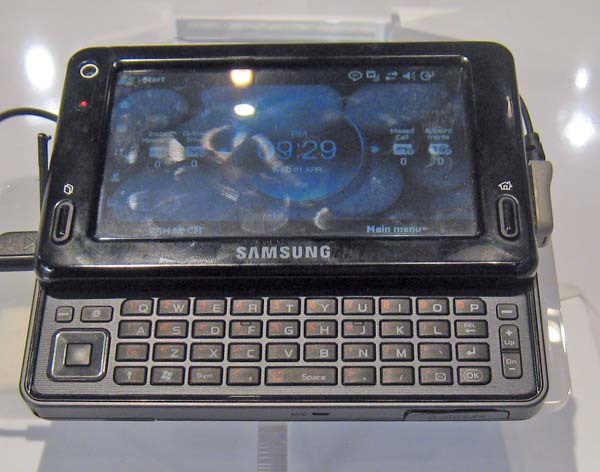 It runs on Windows Mobile, but they will soon have versions for other popular phones. This is a $5/month service. Wi-Ex has been offering cell phone boosters for a few years. The product is call zBoost, and it works fairly well (we have one). However, the older model forces you to place the repeater unit several feet from the antenna to avoid interference. 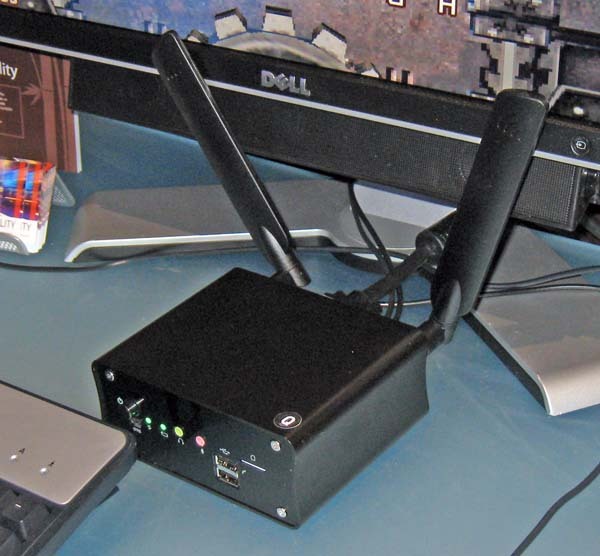 Now they have come up with the zBoost-One, which puts the repeater and antenna into one package. Slick trick. $249. Diaspark is a name that you won't hear about, but you might soon notice shopping flyers (the kind you get in the newspaper) from their customers (e.g. ShopRite and Hy-Vee). Click on a product and learn more. Perhaps there might even be an electronic coupon there. Tri-Spec is making Bluetooth headsets fashionable. These look like regular shades (comes in black, too), but you can be talking to your friends on your phone without looking like you have a growth on your ear. 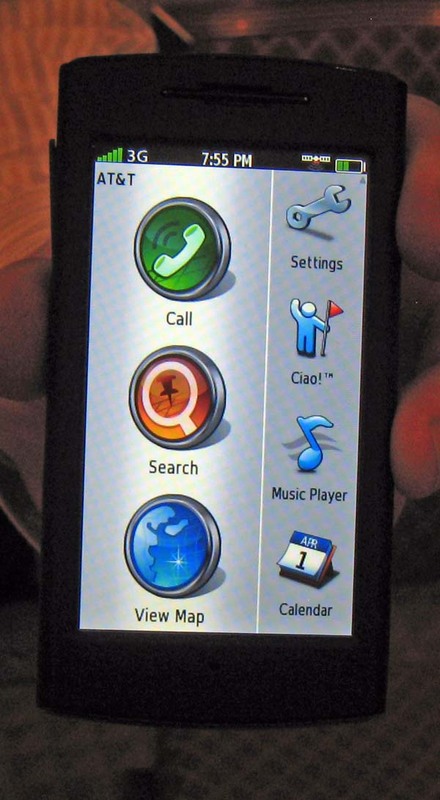 Taking a long hike in the mountains, but want to stay in touch with your phone? 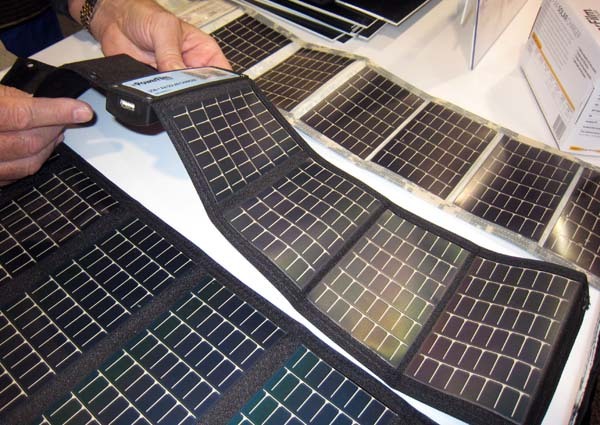 Bring this Powerfilm Solar charger and plug in a USB cable for your phone. Also charges two AA batteries. Puts out 3W (larger sizes exist). Roll it up and stuff it into your backpack when done (it is flexible) $100. Want to engrave your phone (even your iPhone)? For a price of between $10 to $50 (depends upon phone) you can order up a custom laser etched cover from Coveroo. If you have an iPhone, you need to send it in - otherwise, you simply order via the web and a new phone plate is mailed to you. Or, if you are into the warm and fuzzy - get a Funfriends cover for your phone. These look like miniature stuffed animals. Not for use during most business meetings. These will be available for about $10.